We are having some friend over for a day of outdoor games, cards, and a BBQ. On the menu is Smoked Pulled Pork, Vidalia Onion Stuffed Burgers, Grilled Chicken Breasts, Potato Salad, and this Mexican Corn, Tomato, and Queso Fresco Salad recipe I found on the internet. I did modify the internet version slightly. It did not originally call for the tomatoes and Queso Fresco cheese. I thought those extra flavors would round out the salad. The amounts of the ingredients were also changed to suit our tastes. My suggestion is always start with the base recipe and adjust to your taste. 2. Mix corn, tomatoes and chopped cilantro together, set aside. 3. Combine salad dressing, chili powder, lime juice and zest. Mix well. 4. 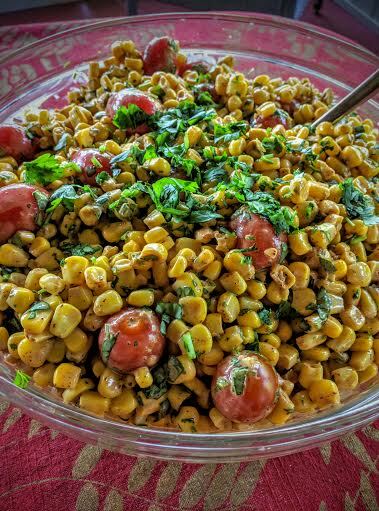 Add salad dressing mixture to corn mixture. 6. Just before serving, add queso cheese crumbles. We had family come up for the weekend and I was looking for something to put together the night before and have ready to pop in the oven first thing in the morning before we started our day. 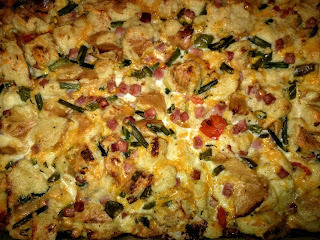 Well, we have all made a breakfast casserole at one point in time or another. I know I have made my share of them. This one in particular sounded appealing because it included asparagus. Which is one of our favorite vegetables. Especially when it is roasted. Now, this recipe did not call for the asparagus to be roasted but I think next time I will try it that way. I did swap out some of the ingredients for the low-fat/fat-free, healthier alternatives, however, the very nature of this type of recipe does lend itself to a few calories. But, everything in moderation, right? 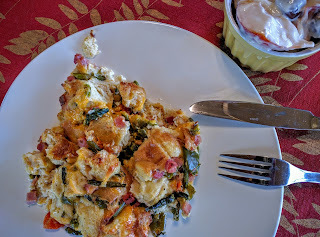 This turned out to be one of the lightest breakfast casseroles I have ever eaten. I hope you enjoy it as much as we did. I have since learned that the Heart and Vascular Institute dieticians have determined that Brummel and Brown Yogurt Spread is the lowest in calories, and best in fats because of its combination of oils. These oils include Palm, Soybean, and Canola. I used a Walmart loaf that was approximately 5-inches wide x 12-inches long. I might try the equivalent in egg substitute next time I make this recipe. 1. In medium skillet, sauté asparagus, pepper and onion in margarine for 3 to 5 minutes. *Broccoli may be substituted for the asparagus. 2. 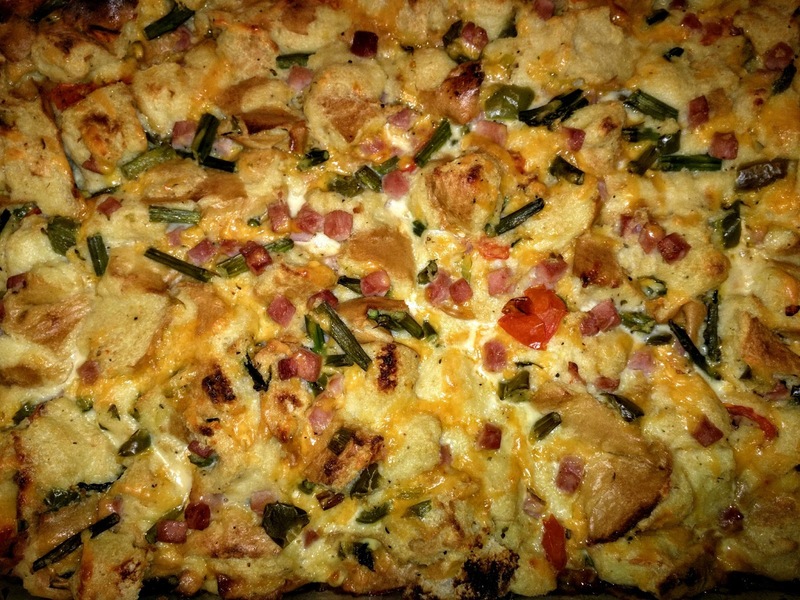 In a mixing bowl, add bread cubes, ham, 1 cup of the cheese and sautéed vegetables and mix well. *Your favorite fat-free cheese may be substituted for the cheddar. 3. Beat together remaining ingredients (except for remaining cheese) until well mixed. 4. Pour mixture over ingredients in bowl and stir well. Pour contents of bowl into a greased 9-inch x 13-inch pan. 5. Sprinkle with remaining cheese. Cover and refrigerate overnight. Bake uncovered at 350°F for 45-50 minutes until golden and puffed. This recipe is from the Sue Bee Honey website and was altered at my discretion. In the past few years middle age has kicked in and the metabolism has pretty much come to a halt. I have been trying to find recipes that still have the great taste and offer something you truly want to eat. 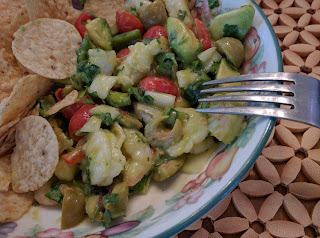 While in Chicago a few weeks ago, I suggested making Ceviche for my mom. She had never had it before and I really loved the recipe I found. I adapted it from a recipe created by chef Rick Bayless for Food and Wine magazine. She loved it! Although Kevin doesn't like seafood, the recipe could certainly be adapted to substitute chicken. Definitely a new staple in our home! 1. In a 1 1/2-quart glass or stainless steel bowl, combine the shrimp, lime juice and onion. Use enough juice to cover the fish and allow it to float freely; too little juice means unevenly "cooked" fish. Cover and refrigerate for about 4 hours, until a cube of fish no longer looks raw when broken open. Drain in a colander. Reserve liquid and onion for adding to remaining ingredients. If you use chicken, simply add the chicken, lime juice, and onion to the remaining ingredients. Variation: You can quickly grill the shrimp until opaque or chicken until cooked through on the grill. 2. 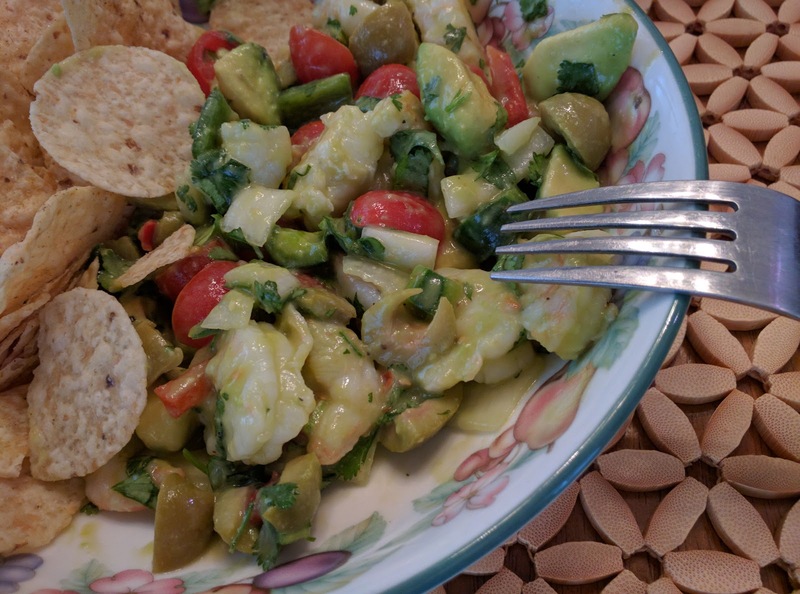 In a large bowl, mix together the tomatoes, green chiles, cilantro, olives and optional olive oil. Stir in the shrimp or chicken and season with salt, usually about 1/2 teaspoon. Add the orange juice. Cover and refrigerate if not serving immediately. Just before serving, gently stir in the diced avocado. Working ahead: The shrimp may be marinated a day in advance; after about 4 hours, when the shrimp is "cooked," drain it so that it won't become too tangy. For the freshest flavor, add the flavorings to the shrimp no more than a couple of hours before serving. There are many ways to serve ceviche. Here are some of our favorites: Place the ceviche in a large bowl and let people spoon it onto individual plates to eat with chips or saltines; spoon the ceviche into small bowls and serve tostadas, chips or saltines alongside; or pile the ceviche onto chips or tostadas and pass around for guests to consume on these edible little plates. Garnish the ceviche with cilantro leaves before serving. You can also serve on a bed of chopped, green leaf lettuce. Chile tends to be known for inexpensive reds, but the real secret is the country's terrific Sauvignon Blancs. The cold winds off the Pacific give Sauvignon Blancs like this one a finely-tuned citrus zestiness, perfect for ceviche (something else they do extremely well in Chile). Well folks, after a much needed break from the blogging world, I am back! I miss being able to find unique recipes, cook, and present them to you all! In an effort to be more health conscious, my new vision for the blog will focus on recipes that I find from various sources and convert them to a healthier version. I will continue to provide some tips, tricks, and fun stories from my life and I hope you enjoy them. Please comment and follow my blog to inspire me!